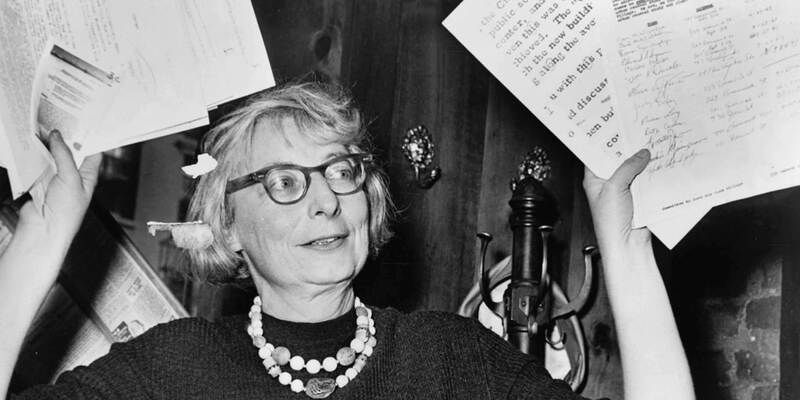 The Rockefeller Foundation and The Municipal Art Society of New York (MAS) announced that the public nominating process for the 2016 Jane Jacobs Medal is open through June 30, 2016, at www.jj100.org. The 2016 Jane Jacobs Medal is open to international nominees for the first time in honor of the 100th anniversary of Jacobs’ birth. An international panel of judges will evaluate the nominations and the winner will be announced in the fall of this year and honored at a reception in Quito, Ecuador, during the United Nations Habitat III conference in October. This global search offers an opportunity to highlight and celebrate local leaders working in cities around the world to advance the Jacobsean principles of fostering local economies, building social capital, creating dense, livable neighborhoods, and promoting urban innovation through self-organization. Jane Jacobs during a press conference at the Lion's Head Restaurant in 1961. Photo: Library of Congress. The Rockefeller Foundation created the Jane Jacobs Medal in 2007 to honor activist, author, and urbanist, Jane Jacobs, who died in April 2006 at the age of 89. The medal is administered by The Municipal Art Society of New York and comes with an award. All honorees must be available for travel to Quito, Ecuador, on October 17-20, 2016. Nominations will be accepted through June 30, 2016, at www.jj100.org, MAS’s digital hub for Jane Jacobs at 100, a six-month global celebration of Jane Jacobs highlighting activities around the world that celebrate Jacobsean principles during the 100th anniversary of her birth. The Rockefeller Foundation’s relationship with Jane Jacobs dates back to the 1950s, when it launched an Urban Design Studies program that helped foster the emergence of the new discipline of urban design and theory. As part of this initiative, one of the Foundation’s first grants was to the then-obscure writer from Greenwich Village, for the research and writing of her seminal book, the Death and Life of Great American Cities. Now more than fifty years later, Jane Jacobs’ work remains one of the most influential books ever written on urban design. For more than 100 years, The Rockefeller Foundation’s mission has been to promote the well- being of humanity throughout the world. Today, The Rockefeller Foundation pursues this mission through dual goals: advancing inclusive economies that expand opportunities for more broadly shared prosperity, and building resilience by helping people, communities and institutions prepare for, withstand, and emerge stronger from acute shocks and chronic stresses. To achieve these goals, The Rockefeller Foundation works at the intersection of four focus areas – advance health, revalue ecosystems, secure livelihoods, and transform cities – to address the root causes of emerging challenges and create systemic change. Together with partners and grantees, The Rockefeller Foundation strives to catalyze and scale transformative innovations, create unlikely partnerships that span sectors, and take risks others cannot–or will not. To learn more, please visit www.rockefellerfoundation.org. The Municipal Art Society of New York, an urban planning and civic engagement non-profit organization, is founded on the same principles that inspired much of Jane Jacobs’ work in New York and around the world. Every year, MAS organizes Jane’s Walk NYC, the largest chapter of the global Jane’s Walk network. From May through October 2016, MAS is hosting “Jane Jacobs at 100,” a global clearinghouse of events happening around the world that promote Jacobsean principles during the 100th anniversary of her birth. To learn more about the 2016 Jane Jacobs Medal and to submit your nominations for this prestigious prize, please visit www.jj100.org. Become a member to enjoy free tour tickets, event discounts, and access to members-only programs and content.